Fred Thompson's otherwise excellent comments re the president begging the Saudis for oil repeated a factual error many of the candidates are making. Thompson is quoted as saying: "It's not in the United States' long-term interest to go hat in hand begging people to do things that in the end we know they're not going to do...What we need to concentrate on is diversifying our own energy sources here in this country and opening up what oil reserves that we have here ... using nuclear more, using clean coal technology more and all the other things that we can do." Here's the error: unlike in the 1970s, today the US hardly generates any electricity at all from oil. To be precise, a mere 2% of our electricity is generated from oil (and conversely only about 2% of our oil demand is due to electricity generation.) Therefore nuclear power, while a valuable technology, has nothing to do with reducing our oil demand; we've already diversified our power sector away from oil. 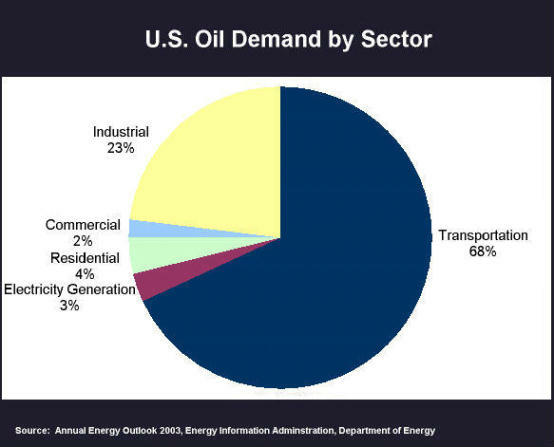 The key source of oil demand, and the source of oil's strategic value, is the transportation sector. If we want to stop kowtowing to the Saudis and their ilk, our focus must be on stripping oil of its strategic value, making it just another commodity We can do this through fuel choice in the transportation sector - through flex fuel vehicles and plug in hybrids which provide a platform on which fuels can compete and open up the transportation fuel market to competition. Salt, after all, was once a strategic commodity too; with the advent of electricity and refrigeration salt lost its strategic value and power to determine world affairs. This entry was posted on Friday, January 18th, 2008 at 2:57 pm and is filed under Flex fuel vehicles, plug in hybrids. You can follow any responses to this entry through the RSS 2.0 feed. Both comments and pings are currently closed.